Hi friends! I hope you're enjoying your Sunday! I am, my son came home for the weekend and we are about to have lunch together before he heads back home. It's been a wonderful weekend, I hate to see it end. I have a quick post today, I made a card and used the Bleaching Technique. I started out by filling one of our Spritzer Bottles with some household bleach and then lightly spritzed my Basic Gray Card stock to get the effect that I wanted. If you try this technique make sure you work in a well ventilated area. I also cut out some flowers using the Blossom Party Originals Die and my Big Shot and then I spritzed the Melon Mambo flowers with bleach. Here's my card, I hope you like it! I'll try to come back and update my post with the supplies used, I'm off to go and enjoy my son before he leaves. Thanks for stopping by and remember to subscribe to my email list you could be selected for my happy mail of the day! I have been a Stampin' Up! Demonstrator since 1997. I enjoy sharing my love of paper crafting and rubber stamping with others! Come and explore the world of rubber stamping with me! I'm here to help you with all your paper crafting needs, be it local or long distance! 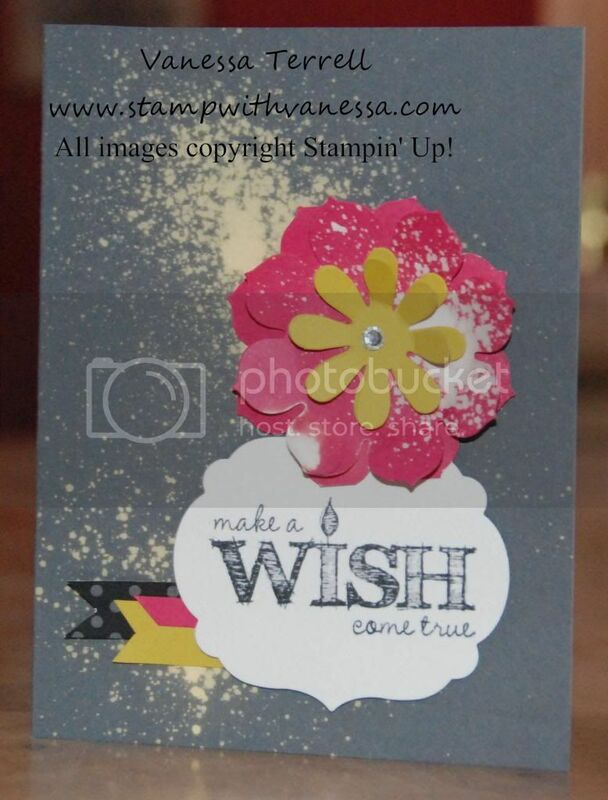 This is the personal blog of Vanessa Terrell, an Independent Stampin' Up! Demonstrator. I am responsible for it's content and Stampin' Up! does not endorse the use of or contents of the classes and services I may offer here.